If you can't imagine a better holiday than exploring the beautiful Lake District, a subscription to Lakeland Walker is perfect for you. Arriving at your door six times a year, you'll read all about the best routes to give you even more motivation to get out on those hills. Lakeland Walker has helpful suggestions for hikers just starting out, as well as new challenges for more experienced visitors. This walking and trekking magazine also gives you trustworthy reviews of gear and equipment to help get you properly kitted out, and local contributors can tell you where to grab a pint, enjoy a good meal or find a bed for the night after a hard day's hiking. Planning your next walking weekend? Let Lakeland Walker inspire and guide you. Whether it’s a hike across the high fells or a lakeside ramble you enjoy most, let Lakeland Walker guide you along the way. 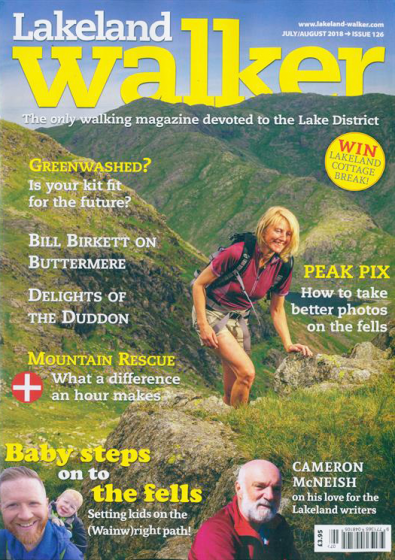 Lakeland Walker is the ONLY walking magazine that focuses SOLELY on the Lake District – by far the UK’s most popular walking destination. Every issue contains at least 10 walks in the region. Lakeland Walker is a bi-monthly publication packed full of easy-to-follow walks in the Lake District illustrated with stunning photography. There’s also regular news from the National Park, events, gear reviews and exclusive reader offers. Most of the magazine’s enthusiastic contributors live in the Lakes and know the National Park like the back of their own hands and every walk they recommend includes precise, step-by-step directions and an accurate map. The wide range of walks featured in the magazine vary from easy lakeside rambles to harder walks for the more adventurous. Lakeland Walker - your essential guide to walking in the Lakes. Be the first person to tell us what you think about Lakeland Walker and you'll save £2.50 on your next purchase!